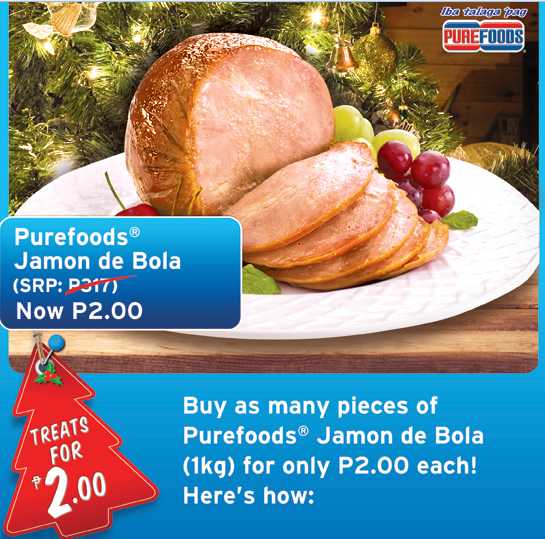 Yesterday, December 22, 2012, Citybank Credit Card holders who received a text message that they can now claim one Purefoods Jamon De Bola for only Php2 at participating Rustan's and Shopwise stores in the Metro had to endure the long lines and unsystematic process. The process took more than 4 hours to complete. Ay, sinabi mo pa, the lines are insane and HB na lahat ng tao sa lines. I thought pandemonium would break loose any moment last night. Ha ha ha! Please provide chairs or stools. Some of these people lining up are physically not capable to stand for 4 hours, such as the senior citizens and people with certain illnesses. Kayo din, isipin na lang ninyo nanay o lola o lolo ninyo na nakatayo ng apat na oras. Please turn on the air conditioner. One new found friend in line said she can bear standing up for 4 hours but at least make it more comfortable by providing them cooler air. Please separate the lines of those credit card holders who will claim only one or two Jamon de Bola, it is unfair to line up for 4 hours and be delayed because some credit card holders claim up to 30 pieces of Purefoods Jamon De Bola each. Please add some more staff that will process the Php2 transaction fee. Based on actual experience and observation, mag isa lang yun staff ng shopwise na nag pa punch ng lahat ng transactions last night. Overall, your clients are happy with their Php 2 Purefoods Jamon De Bola but please do hear them out. Merry Christmas. Yun may mga alalay na senior citizen papilahin na lang po ninyo ang maid o driver niyo at magdala kayo ng folding chairs para po hindi kayo mahirapan masyado. Merry Christmas! ang mura naman. I bet marami talaga ang pumila..